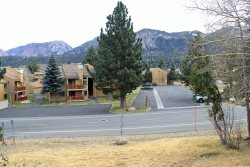 Nice One Bedroom and One Bath condominium located walking distance to the Canyon Lodge Ski Lift Area in Mammoth Lakes. Sleeps up to 4. 1 King bed in bedroom (new mattress March 2012) & 1 Queen fold out couch (new mattress March 2012) in the living room. Two Flat Screen TVs, two VCRs, stereo/CD player. New carpet installed June 2012. Phone in unit 760-934-5065. UNLIMITED LONG DISTANCE AND WIFI PROVIDED IN UNIT. (780 Sq. Ft.) The unit is all one level and you enter from an interior hallway in the Chamonix A Building. There is one outdoor parking space available. Chamonix Recreation room with large screen TV, reading area, ping pong, foosball, and business center with fax, copier, computers w/ internet and laptop hook-up. Sauna, hydro spas, seasonal/summer swimming pool & BBQ area. Coin-operated laundry facilities located in the common area near the office. COMPLIMENTARY INTERNET and CABLE TV are provided, however NO REFUNDS will be given for connectivity problems or Internet failure. TOT LICENSE 1968-CX07. Great location. So close to Canyon Lodge. The Chamonix complex has a good hot tub and convenient parking.